This is a Mongolian name. The given name is Elbegdorj, and the name Tsakhiagiin is a patronymic, not a family name. Tsakhiagiin Elbegdorj (Mongolian: Цахиагийн Элбэгдорж, Cahiagín Elbegdorj Mongolian pronunciation: [t͡sʰaxiaˈgiːŋ ˈeɮpegˈtɔrt͡ʃ]; also referred to as Mongolyin Tsakhiagiin Elbegdorj; born 8 March 1963) is a Mongolian politician who has been President of Mongolia since 2009. He previously served as Prime Minister in 1998 and again from 2004 to 2006. Elbegdorj is considered one of the principal champions in emerging markets and was one of the architects of democracy in Mongolia. Elbegdorj was one of the key leaders of the 1990 Mongolian democratic revolution that ended 70 years of communist rule in Mongolia, and co-drafted the country's 1992 constitution that guaranteed democracy and a free market economy. Elbegdorj has been labeled by his supporters as a "freedom fighter" and the "Golden Sparrow of Democracy," alluding to a bird that comes with spring sunshine after a long, harsh winter. Elbegdorj is the founder of the Ardchilal (English: Democracy) newspaper – the country's first independent newspaper – and helped to establish the first independent television station in Mongolia. His tenure has focused on fighting corruption, environmental protection, women's rights, judicial reform, civic engagement, economic liberalization and privatization, property rights, and the abolition of the death penalty. Elbegdorj was born into a nomadic herding family in Zereg sum, Khovd province, on 8 March 1963. He was the youngest of eight sons. Elbegdorj spent most of his early childhood herding livestock through the high mountains of Zereg sum. His father, Mongolyn Tsakhia, was a veteran of Mongolia's border conflict with the Empire of Japan that resulted in the 1939 Battle of Khalkhyn Gol. Elbegdorj finished the sum's eight-year school (Primary & middle school) in 1979. Afterwards, his family moved to Erdenet City, and he finished Erdenet's No. 1 ten-year school (High school) in 1981. In 1981–82, Elbegdorj worked in copper ore mining and processing plant Erdenet Concern (currently Erdenet Mining Corporation) as a machinist. In 1982 he was drafted into military service. For submitting poems to the army newspaper Ulaan Od, which impressed army authorities, and heading a Revolutionary Youth Unit in the army, he was awarded with the possibility to study military journalism and Marxism–Leninism at the USSR's Military Political Institute (present Army Academy named after Hetman Petro Sahaydachnyi under the umbrella of Lviv Polytechnic National University in Lviv, Ukraine from 1983 on. He graduated from the academy in 1988 with a bachelor's degree in journalism and then began working for the newspaper Ulaan Od (Red Star). After his first term as prime minister, he spent a year at the University of Colorado Boulder's Economic Institute. Then Elbegdorj studied with a full scholarship at Harvard University and graduated from Harvard's John F. Kennedy School of Government with a Master of Public Administration (MPA) in 2002. Elbegdorj talking at a demonstration, December 1989. Text reads in Mongolian language: "Cherish our history, embrace our freedom, develop our country"
During his studies in the USSR, Elbegdorj learned about Glasnost, the concepts such as freedom of speech and economic liberties. After returning to Mongolia, he met other like-minded people and tried to present those ideas to a wider audience, despite attempts of repression from the Politburo-authority of the government, and threats by his employer to lose his job. At the end of a speech at the Young Artists' Second National Congress on 28 November 1989, Elbegdorj said that Mongolia needed democracy and appealed to youth to collaborate to create democracy in Mongolia. He told the audience "We consider that Perestroika is a timely and brave step. Youth's contribution to this revolutionary matter is not by supportive talks but by certain work. Our contribution is our objectives to be fulfilled. Our objectives are: ... following democracy and transparency and contributing to glasnost, ... and supporting fair progressive power ... These are the objectives of an initiatives' group-an organization that shall work. After the congress I hope we will gather and discuss with you about it in this (newly forming group). The organization shall be based on public, voluntary and democratic principles." The chairman of the congress stopped Elbegdorj's speech and warned him not to say such things. It was 1989 and Mongolia had been a communist country for 68 years. At that time, it was alleged that every other person was an unofficial communist party spy who would report people who expressed opinions other than socialism and communism. During the break of the congress, two young individuals met Elbegdorj and the three agreed to found a democratic movement and to secretly spread the news to other young people. Later the three met and united with ten other individuals and they are known as the Thirteen Leaders of Mongolia's Democratic Revolution. On his return from the congress, his boss at the newspaper Ulaan Od warned Elbegdorj that he would be fired if he participated further in any activities out of work or engaged in any conduct inconsistent with communist and socialist ideology. Despite the warning, Elbegdorj and his friends met secretly with other young people in the circle auditorium of the National University of Mongolia and discussed democracy, free market economic policy, and other prohibited subjects of the time, and began to draft a plan to organize a democratic movement. They met many times and brought new friends and new supporters to join them secretly. One night they placed ads of their open demonstration in streets. On the morning of 10 December 1989, the first open pro-democracy demonstration met in front of the Youth Cultural Center in Ulaanbaatar. There, Elbegdorj announced the creation of the Mongolian Democratic Union. The Mongolian Democratic Union founders publicly petitioned the government for a real implementation of perestroika, including allowing a multi-party system, the total implementation of the Universal Declaration of Human Rights in all party and government affairs. In subsequent months activists led by Elbegdorj and others continued to organize demonstrations, rallies, protests and hunger strikes, as well as teachers' and workers' strikes. Activists had growing support from Mongolians, both in the capital and the countryside and the union's activities led to other calls for democracy all over the country. After numerous demonstrations of many thousands of people in the capital city as well as provincial centers, Mongolian People's Revolutionary Party(MPRP) (present Mongolian People's Party)'s Politburo – the authority of the government eventually gave way to the pressure and entered negotiations with the leaders of the democratic movement. Jambyn Batmönkh, chairman of Politburo of MPRP's Central Committee decided to dissolve the Politburo and to resign on 9 March 1990. This paved the way for the first multi-party elections in Mongolia. Elbegdorj announced this news to the hunger strikers and to people who'd gathered on Sükhbaatar Square at 10PM on that day after the negotiations between leaders of MPRP and Mongolian Democratic Union. As a result, Mongolia became the first Asia country to successfully transition from communist rule to democracy. Elbegdorj worked as the Leader of the Mongolian Democratic Union in 1989–1997. In a documentary film about the President (titled: "Man of the People") released in the year of the 25th anniversary celebrations of the Mongolian democratic changes, President Elbegdorj tells the story the historical political change and about reinventing democracy. Elbegdorj worked as a correspondent at Ulaan Od-newspaper of the Mongolian Armed Forces and as a chief of an army literature unit between 1988 and 1990. While in these positions Elbegdorj wrote articles disclosing all the good and bad in the army units and suggested improvements for the army prior to democratic movement's beginning. Elbegdorj founded Mongolia's first independent newspaper Ardchilal (Democracy) and worked as its first editor-in-chief in 1990. The newspaper played a major role to complete the country's democratic revolution. He co-introduced freedom of press in the country by co-initiating Law on Press Freedom and playing a key role to pass the law in 1998. Elbegdorj also helped to create Mongolia's first independent TV station Eagle TV in 1994. It was run by the former Mongolian Broadcasting Company, a joint-venture of the U.S. Christian missionary organization AMONG Foundation, and the Mongolia Media Corporation. Elbegdorj was elected to the Parliament four times, in 1990, 1992, 1996 and 2008. As a Member of People's Congress, Elbegdorj co-drafted and co-adopted Mongolia's new Constitution on 13 January 1992. The new Constitution guaranteed human rights, democracy, freedom of religion, and free speech. An international intellectual once referred Elbegdorj as "Mongolia's Thomas Jefferson." Elbegdorj, as the chairman of the Democratic Party, co-led the Democratic Union Coalition to its historic victory in the 1996 parliamentary elections. He served as the Majority Leader of the State Great Hural (Parliament) in 1996–2000 and as the Vice Speaker of the Parliament in 1996–1998. Elbegdorj founded and worked as the head of Mongolia's first Entrepreneurs Association in 1991 as well. The association helped to privatize livestock for free to their herders from the socialist collective farms. As a result, the first private property was given to almost half of Mongolia's entire population. He supported the privatization of state-owned properties and assets and land. While as the chairman of the State Commission on Rehabilitation, Elbegdorj initiated and brought the state to apologize for the victims and families of over 36,000 people that had been persecuted and mass massacred during the years of Mongolian People's Party's communist rule. He played a key role in the approval of the Rehabilitation Law, which provided rehabilitation and compensation to the survivors and families of political victims, and recovery from the Stalinist purges and prohibited future violation of human rights. In addition, the law established a Memorial Day for Political Victims. Furthermore, Elbegdorj was a member of the National Counseling Committee of the Democratic Party in 1994–2009; leader and chairman of the Democratic Party in 1996–1999, and April 2006 – September 2008 respectively; and chairman of the Democratic Union Coalition of the Mongolian National Democratic Party and Mongolian Social Democratic Party in 1996–2000. 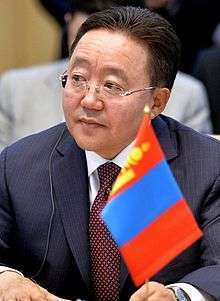 Elbegdorj served as the Prime Minister of Mongolia twice in 1998 and 2004–2006. In 1998, a clause in the constitution was removed that prohibited members of parliament to take cabinet responsibility. Thus on 23 April 1998, the Parliament elected (61–6) Elbegdorj as the Prime Minister. During his first term, Elbegdorj attempted to solve looming economic, structural and political issues through several policy initiatives such as co-initiating Law on Press Freedom and playing a key role to pass the law in 1998. Based on this law, another law passed that changed all daily state newspapers into public newspapers without direct control and censorship from the government. Elbegdorj's most significant achievement during his first term as Prime Minister was to collect tax and create tax income. The biggest tax payer and only significant income contributor to the government's budget at the time was the copper ore mining and processing Erdenet Mining Corporation(EMC) – a joint stock company owned by the governments of Mongolia and the Russian Federation. EMC hadn't paid due tax, income and royalty to Mongolia's government between 1997 and 1998 which resulted in the financial crumbling of the government. Because of it, previous Prime Minister Enkhsaikhan stepped down due to pressure from the opposition party, MPRP. After becoming Prime Minister, Elbegdorj ordered an audit of EMC. The audit result revealed that the state due income did not enter the state account, instead it went to dubious accounts of directors at EMC. This embezzlement case was reported in detail in investigative series "Swindle of the Century" on Eagle television. Elbegdorj dismissed the EMC's chairman. As a result, the government began to receive due tax, royalty and income from the EMC. In addition, at the recommendations of international financial institutions such as International Monetary Fund and the World Bank – aid granters to Mongolia, and discount interest rate loan giver Asian Development Bank, Elbegdorj made a decision to sell state owned Reconstruction Bank which became illiquid and was experiencing tremendous loss, the biggest financial burden to the economy since its establishment in 1997. Golomt Bank was the only one that offered to buy Reconstruction Bank. In response to this and the change of EMC's chairman, the minority group at the Parliament MPRP demanded Elbegdorj to resign and thus resulted Elbegdorj to lose confidence vote at the Parliament. The Parliament had prevented Elbegdorj's government from selling the bank. Elbegdorj's decision to sell the Reconstruction Bank was proven to be correct. The bank bankrupted soon after Elbegdorj's first term as prime minister was over and the bankruptcy led the government to suffer gigantic amount of financial loss. Moreover, Elbegdorj made a decision to financially assist from tight budget to complete the construction of Mongolia's first Wrestling Palace which was half built for a long time. He stayed in office until Janlavyn Narantsatsralt replaced him on 9 December 1998. Elbegdorj served as the chairman of the Majority Group of the Parliament and the leader of the Democratic Union Coalition and a Member of Parliament respectively in 1996–2000. In 2000–2001, he studied at the University of Colorado Boulder's Economic Institute, and earned a diploma. Then he studied with a full scholarship of Harvard University at Harvard's John F. Kennedy School of Government and graduated with a Master of Public Administration (M.P.A.) in 2002. Then he worked as a consultant at the Millennium Development Goal Project, United Nations Headquarters in New York City and as a consultant at Radio Free Asia in Washington, D.C. in 2002–2003. Afterwards, he returned to Mongolia and made series of public speeches touring in Mongolian provinces inspiring the people and the youth sharing his new ideas and perspectives based on his knowledge from Harvard University and the United States in combination with Mongolian way of life in 2003–2004. His lectures played a significant role to make Democratic Party get majority seats in 2004 Mongolian Parliamentary elections. On 20 August 2004, Elbegdorj became the Prime Minister of Mongolia for the second time. This time he headed a grand coalition government after the vote in the parliamentary elections had been evenly split between the two major political forces – Democratic Coalition and the Mongolian People's Revolutionary Party. U.S. President George W. Bush highlighted about Elbegdorj as one of the country's democracy leaders to have been serving as the Prime Minister in his speech in Ulaanbaatar on 21 November 2005. "The world needs more people such as yourself who are willing to admire liberty," President Bush wrote Elbegdorj immediately after his visit to Mongolia. During Elbegdorj's term, on 27 January 2005, the government controlled National State Television and Radio were converted into formally independent public organisations with increasingly smaller control by the government. Also, legal provisions that prohibited demonstrations on Ulaanbaatar's Sükhbaatar Square were abolished on 17 November 2005. In his second term as Prime Minister, Elbegdorj proclaimed a fight against corruption and poverty, which he saw as the biggest challenges to Mongolia's economic development. Elbegdorj's government signed the United Nations Convention Against Corruption in April 2005 and ratified it in January 2006. His administration revealed the Customs chairman's corruption case amounting to millions of dollars from which the ex-chairman donated hundreds of thousands of dollars to the MPRP in 2005. Elbegdorj attempted to support domestic businesses by eliminating excessive regulations, many licensing requirements, and import taxes for key category products. Mongolia was accepted into the European Union's GSP+ system, which allows Mongolian exporters to pay lower customs tariffs when exporting to the European Union during Elbegdorj's term as prime minister. To promote affordable computers and internet access, Elbegdorj established Information and Communication Agency under the government. He subsidized and supported technical schools and specialized professions to reduce unemployment. By a decision of his government English replaced Russian as the first foreign language to be taught in public schools. In addition, Elbegdorj initiated the erection of the Genghis Khan memorial complex in front of Mongolia's government house for the 800th Anniversary of the Great Mongol Empire. Besides, Elbegdorj initiated a "Green Wall" environmental project to plant trees in barren areas and desert zones to prevent from massive sandstorms from Mongolia reaching to North America and to reduce air pollution. In August 2005, Elbegdorj wanted to run in by-elections in Ulaanbaatar's Bayangol district. However, the MPRP threatened to leave the coalition if Elbegdorj ran against MPRP candidate Miyeegombyn Enkhbold, and Elbegdorj withdrew. On 13 January 2006, the MPRP left the coalition anyway, and Elbegdorj was forced to resign. The MPRP proceeded to form a new government with the help of DP defectors and independent MPs, and Miyeegombyn Enkhbold became the new prime minister. The events triggered protests from some civic groups and their followers. Mongolian economy had real GDP growth of 10.4% in 2004, 7.3% in 2005 and 8.6% in 2006 respectively during Elbegdorj's second term as Prime Minister comparing to 7% in 2003 prior to Elbegdorj's government. At the Democratic Party's convention on 3 April 2009, Elbegdorj defeated Erdeniin Bat-Üül in a contest for the Party's nomination for the Presidency of Mongolia. Elbegdorj won with 65.3% of the total vote. After Elbegdorj was announced as the candidate, the Civic Will Party and the Mongolian Green Party endorsed Elbegdorj's presidential candidacy. Elbegdorj won the 2009 Mongolian presidential election on 24 May 2009 with 51.21% of the votes. Defeating incumbent president Enkhbayar who got 47.41%. Elbegdorj was sworn into office as President of Mongolia on 18 June 2009. 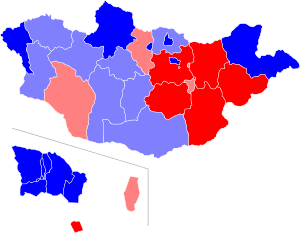 Election result: Provinces and Ulaanbaatar districts won by Elbegdorj (blue), Bat-Erdene (red). Darker shades represent a majority (more than half), lighter shades represent pluralities. The Democratic Party's National Consultative Committee held its convention on 7 May 2013 and decided to re-nominate Elbegdorj as a presidential candidate with 100% votes. And the Congress of Democratic Party, with 7,000 participants in Ulaanbaatar plus participants in all provincial centers connected via live internet video conference voted 100% for Elbegdorj's nomination from the Democratic Party for the 2013 presidential election on 8 May 2013. Civil Will-Green Party and Mongolian National Democratic Party – which have seats at both the parliament and the government cabinet – endorsed Elbegdorj's presidential candidacy. The Republican Party and the Motherland Party expressed their full support for Elbegdorj's candidacy also. Elbegdorj won the 2013 Mongolian presidential election on 26 June 2013 with 50.23% of total votes while opposition Mongolian People's Party's candidate Badmaanyambuugiin Bat-Erdene received 41.97%, and Natsagiin Udval, candidate of Mongolian People's Revolutionary Party got 6.5% of total votes. U.S. President Barack Obama issued a statement on presidential election in Mongolia on 27 June 2013, the same day the election result was announced. President Obama stated: "President Elbegdorj has been an important leader in advancing democracy and freedom in his country and a key partner for the United States in Asia and globally ... Through its impressive democratic achievements and its progress on economic liberalization, Mongolia serves as a significant example of positive reform and transformation for peoples around the world." Vuk Jeremić, President of the United Nations General Assembly for the 67th session expressed satisfaction with the fair and successful election in his congratulations to Elbegdorj on 27 June 2013. UN Secretary General Ban Ki-moon congratulated for successful Presidential election in Mongolia in his congratulatory message to Elbegdorj. European Commission President José Manuel Barroso said "The European Commission considers that the presidential election has become another vital step of the Mongolian people to establish a democratic society that respects the rule of law and human rights" in his congratulatory note to Elbegdorj on 28 June 2013. German Chancellor Angela Merkel pointed out "The Organization for Security and Co-operation in Europe sent its group to Mongolia for the first time to observe the presidential election, and it was an expression of strengthening democracy and transparency in Mongolia," in her congratulations to Elbegdorj. Elbegdorj won the Mongolian presidential elections twice: on 24 May 2009; and 26 June 2013. Elbegdorj was sworn into office on 18 June 2009 for his first term, and on 10 July 2013 for his second term as President of Mongolia. Elbegdorj is Mongolia's first president to never have been a member of the former communist Mongolian People's Revolutionary Party and the first to obtain a Western education. Elbegdorj was sworn into office for his first term as President of Mongolia in State House in front of the Parliament and guests on 18 June 2009. His inauguration ceremony included his address to the nation and a military parade on Sükhbaatar Square. The United States Senate passed Resolution Number 192 supporting Mongolia's democracy and economic development and noting Elbegdorj's election victory on the day he was sworn in on 18 June 2009. For his second term as President of Mongolia, Elbegdorj was sworn into office in front of the Chinggis Khaan (also referred as Genghis Khan) monument, Nine White Banners of Mongolia, the Parliament and public on Sükhbaatar Square on 10 July 2013. This is the first time a Mongolian president made an oath in front of public in the country's history. After making an oath, he addressed to the nation, and a military parade followed. Nobel Peace Laureate, co-founder of the Soviet bloc's first independent trade union Solidarity, former Polish President Lech Wałęsa attended Elbegdorj's second inauguration as President. Elbegdorj served as a chair of the Community of Democracies from 2011 to 2013, an intergovernmental coalition of democratic countries to which Mongolia is a participating member. Under his presidency, Mongolia successfully organized the VII Ministerial Conference of the Community of Democracies with democracy icon guest speakers namely chairperson of the National League for Democracy in Burma and Nobel Peace Laureate Aung San Suu Kyi, "Mother of the Revolution" of 2011 Yemeni uprising and Nobel Peace Laureate Tawakkol Karman, Elbegdorj, Thailand's Prime Minister Yingluck Shinawatra and more on 27–29 April 2013. The conference had over 1300 participants from more than 100 countries and issued Ulaanbaatar Declaration "Community's Attainments and Global Challenges." Within the coalition, Elbegdorj led initiatives such as Zero Tolerance to Corruption and Education for Democracy and spoke on behalf of the initiatives at the 66th session of the General Assembly of the United Nations on 21 September 2011. He worked with the coalition members to form an agenda to consolidate civil society and strengthen democracy. Elbegdorj is a frequent lecturer on democracy and human rights, both domestically and abroad. Elbegdorj said in his speech "It is a human desire to live free that is an eternal power" at Kim Il Sung University in North Korea. Elbegdorj remarked "I truly believe in freedom for each and every individual" at the Bundestag. One of his latest public speeches is "Myanmar and Mongolia: On the Road to Freedom and Democracy" made jointly with Nobel Peace Laureate Aung San Suu Kyi in Ulaanbaatar on 30 April 2013. Aung San Suu Kyi publicly expressed her appreciation in person to Elbegdorj for having been a strong voice in Asia for her release from house arrest in Myanmar (Burma) until her release. At the ASEM8 Summit on 3 October 2010, Elbegdorj openly called on Myanmar's authorities to free Nobel laureate Aung San Suu Kyi from house arrest, and not long after she was released. In June 2016 President Elbegdorj visited the newly elected State Counsellor and Minister of Foreign Affairs, Aung San Suu Kyi "in honor of the 60th anniversary of the diplomatic ties between Mongolia and Myanmar". During the same visit he addressed a full house audience of civil servants sharing the values of democratic societies, urging them to fight against corruption. In 2012, following his talks at the Parliament of Kyrgyzstan and meeting with Kyrgyz NGO leaders and students to share Mongolia's experience towards democracy for two decades, Elbegdorj began the establishment of the Democratic Transition Assistance Foundation of Mongolia. The new initiative calls for the allocation of certain funds from Mongolian budget to be used to support democratic transitions in Kyrgyzstan and Afghanistan along with economic reforms in countries such as North Korea and Myanmar while using Mongolia's democratic reform and consolidation as a model. In the summer of 2012 the foundation hosted several delegation from Kyrgyzstan, North Korea and Myanmar to study from Mongolia's experience of judicial reform and mineral legislation. To encourage the adoption of democratic governance in Asian countries, Elbegdorj, along with Korean President Lee Myung Bak, started the Asian Partnership for Democracy initiative in 2011 as an arm of the Community of Democracies with a particular focus on the region in which Mongolia is one of the longest standing democracies. Elbegdorj condemned the violence in Syria and called on world leaders to unify to end the bloodshed. He criticized the attack on the US Embassy in Libya by saying "The mission of diplomacy is peaceful. Attacking diplomatic compounds are violation of both the letter and spirit of international law," in his address to the 67th session of the United Nations General Assembly on 27 September 2012. The U.S. Foreign Policy Association and the National Endowment for Democracy (NED) awarded Elbegdorj with New York Democracy Forum's Presidential Medal on 22 September 2011. The award recognized "the vital role Elbegdorj played in Mongolia's historic democratic revolution in 1989, the country's successful democratic transition, the consolidation of its new democratic institutions and his solidarity with other democrats in Asia, the Middle East and other regions." In 2000 Elbegdorj founded Mongolia's Liberty Center, a non-governmental organization advocating human rights, freedom of expression and education. Elbegdorj spoke at many democracy conferences including "Re-founding America" conference sponsored by the International Society for Individual Liberty in Williamsburg, Virginia, United States in 2007 prior to his presidency. In 2009, Elbegdorj opened the Citizens' Hall – a public hearing forum which encourages the participation of Mongolian citizens in the parliament's decision making. In each proceeding, citizens are given time to speak and express their opinion on pending legislation. The hall is open to any of Mongolia's 2.9 million people and is located in Ulaanbaatar; some additional halls have been opened in other provinces. They are designed to encourage civil participation to have consensus between legislators and citizens before any open issue becomes law. Elbegdorj emphasized "Democracy is about empowering the people and not bestowing power to someone," "The time has come to transfer to the discretion of the people, to the business and professional communities especially in the countryside the power to make decisions for themselves and to engage in businesses and services they are naturally entitled to," "The progress and prosperity of a civil society is defined not by centralization of power, but with transfer of rights, effective exercise of the rights by people," in his inaugural address for his first term as President. Elbegdorj created a concept for decentralization: increasing local powers with civic participation, creating local development funds, and giving financial support to local authorities from central government budget. He submitted the concept to the Parliament to make it a part of new Organic Budget Law and the law was passed with the part. When the bill was under discussion, the Presidential Office in collaboration with the Budget Standing Committee of the Parliament organized "Empowering Local Administration with Civic Participation" forum with guest speakers from Direct Democracy Center in Switzerland at Elbegdorj's invitation on 27 May 2011. The center's director also lectured on "Local level structure of direct democracy in Switzerland" to Mongolian students. Then Elbegdorj's office developed a policy document reflecting suggestions of citizens discussed in the Citizens' Hall and Elbegdorj issued a decree to approve "Medium and long term national policy document on decentralization through direct democracy and civic participation." Then, from 8 September 2012 through April 2013, his office jointly with local governments and parliaments organized nationwide training "Direct democracy – Budget management with civic participation" for ordinary citizens, civil servants and local authorities about how citizens can participate in local government budget spending from local development funds to decide life in their localities. Elbegdorj said "citizen participation and monitoring are still missing in the public decision making. There cannot be a civil society without citizen participation," in his remarks at the National Diet of Japan in 2010. Elbegdorj has long been an advocate for women's rights and more proportional representation of women in decision making level of governments. He stressed the importance of women in leadership, highlighting the three-fold increase of women representatives elected in the 2012 Mongolian parliamentary elections in his speech at the UN General Assembly in September 2012. "We need more women leaders. Women tend to see the whole picture. For society to advance, we need more women in public service at all levels – local to global. They bring an unique perspective often missing in global challenges," Elbegdorj said "Have you ever heard of a woman bloody dictator or tyrant? I think not. If there were more women in power, I think we would have more harmony, more engagement and less suffering and less conflict." On 9 July 2012 during the meeting with Elbegdorj in Ulaanbaatar, U.S. Secretary of State Hillary Clinton praised Mongolia's recent parliamentary elections in which nine women were elected and applauded Mongolia for its "courage" in building a democratic system in a country surrounded by Russia and China. "Mongolia encourages women’s involvement in the political system with the intention of improving their role in society" Elbegdorj said in his lecture at the Diplomatic Academy of Vietnam in November 2013. In the 2013 Mongolian Presidential election, Natsagiin Udval, Mongolia's first female presidential contender ran against Elbegdorj. Elbegdorj said "Public policies on social welfare or protection should reflect kindness and tenderness of mothers," in his public lecture at Yangon University in Yangon, Myanmar. Elbegdorj stated "Capital punishment is wrong–it degrades human dignity. It brings no peace to society. It does not deter crime and does not lift up mankind," in his speech at the High-Level Meeting on the Rule of Law of the 67th session of the United Nations General Assembly on 24 September 2012. "By ratifying the Second Optional Protocol Mongolia would add yet one more country in the world community to fully abolish the death penalty. Pardoning a life does not mean pardoning a penalty. The punishment for serious and cruel felonies must be severe, and must be just. However, I do not think it is just to deprive any citizens of life in the name of state. The right to life is one of the fundamental rights of a human being and cannot depend on anyone, not even on the head of state. The state should respect very fundamental human rights, and secure them by law," Elbegdorj pointed out in his greeting to the delegation of the 5th international meeting of Justice Ministers on 18 May 2010. Four months after Elbegdorj's announcement of a moratorium of death penalty by his pardon, a survey was conducted among Mongolian legal academics asking whether it is right or wrong to abolish death penalty in Mongolia. 83% of the survey participants responded that it was wrong. They criticized "By pardoning death row inmates, the Mongolian President directly interferes in criminal procedures. Nobody has the right to change court rulings." According to Article 33.1.8 of the Constitution, the Mongolian president has the prerogative "to grant pardon." Some academics and critics considered that it is too early and wrong to abolish death penalty in Mongolia, explaining that murder crimes are becoming too brutal and severe since the death penalty would not be implemented. Despite much criticism from domestic conservative politicians, the opposition, and critics, Elbegdorj's decision was positively received internationally. Amnesty International noted "President Elbegdorj's actions demonstrate commitment to the protection of human rights and set a good example for other Asian countries in the region," on 18 February 2010. International organization "Hands off Cain" awarded Elbegdorj with "Abolitionist of the Year 2011" noting Mongolia as an example that fosters the right to life among Asian countries. Finally, in 2012, the Mongolian parliament amended a law to join the Second Optional Protocol to the International Covenant on Civil and Political Rights, making Mongolia a state party to the convention and reinforcing the country's commitment to the abolition of capital punishment. For the 6th World Congress Against the Death Penalty in June 2016., President Elbegdorj sent a video message in which he stands up against capital punishment and shares his views and taken actions to fully abolish death penalty in Mongolia. He did share the same views during his visit to Strasbourg in 2015 addressing the European Parliament. About foreign policy, "Mongolia shall remain an active member of the international community and shall actively cooperate in addressing regional and global challenges," Elbegdorj emphasized in his inaugural address for his first term as President of Mongolia on 18 June 2013. Also he noted that Mongolia shall foster and expand cooperation with the country's two neighbors and "third neighbors," in the same address. "Mongolia shall consistently continue her traditional foreign policies enriched with new content and dimensions," he stated in the same speech. Strengthening the relations with the countries of the European Union President Elbegdorj addressed the European Parliament in Strasbourg, in June 2015. In his speech he defines Mongolia as a strategic anchor for the EU in the East: "The EU is the world’s premier invention for advancing global prosperity, peace and harmony. Mongolia will be a strategic anchor for the EU in the East, helping advance our shared values and interests, and for building peace, democracy and engagement in Asia". In a documentary film titled "Mongolia – Democratic Anchor of the East" the President is interviewed about the third-neighbour policy and foreign affairs. Elbegdorj reiterated "Mongolia shall continue her open and pro-active engagement and cooperation at the regional and international fora," "Mongolia shall continue her constructive cooperation with other countries and international organizations. We shall work to promote mutually beneficial and constructive decisions in bilateral relations with our neighbors in infrastructure, investment, trade, transit transport and other pending issues," in his inaugural address for his second term as President on 10 July 2013. Elbegdorj praised the choice of the Kyrgyz people for parliamentary governance and their resolute struggle for freedom and justice in his speech at the Kyrgyz Parliament in April 2012. Following traditional friendly relations with North Korea, Elbegdorj has a good relationship with North Korea. 50,000 North Korean football fans cheered Elbegdorj in a stadium for his football kick during his official visit to North Korea in October 2013. He also held a speech titled "It Is the Human Desire to Live Free That Is an Eternal Power", as the first foreign Head of State to read a lecture on this topic at the Kim Il Sung University. Elbegdorj has committed Mongolia to be nuclear-free and a nuclear free world as a principal component of his foreign policy agenda. The United Nations Security Council recognized Mongolia's nuclear-weapon-free status on 17 September 2012 despite the fact that it cannot join one of the World's Nuclear-Weapon-Free-Zones, in part, because of the country's close proximity to nuclear-armed states Russia and China. Mongolia renounced nuclear materials and became a member of Organization for Security and Co-operation in Europe in 2013 and UN General Assembly's President Vuk Jeremic congratulated Elbegdorj for these. Elbegdorj made international headlines in 2012 after being the first world leader invited to visit the Iranian nuclear facility in Natanz. After his visit, he stressed "the program has to be transparent to the world; in particular, the program must be under permanent supervision of the United Nations and the International Atomic Energy Agency. Iran's nuclear program must not endanger or cause threat to the interests and security of regional peace as well as of any other nation. Mongolia remains committed to safeguarding her nuclear free status, supported by the special UN resolutions. Mongolia will seek to contribute to securing universal peace by fully banning nuclear weapons in East Asia and the world at large." Opposing to storing nuclear waste in Mongolia, Elbegdorj said "We ... firmly oppose to storing nuclear waste on Mongolian soil," in his speech at the High-Level Meeting on the Rule of Law of the 67th session of the United Nations General Assembly on 24 September 2012. Before, he noted it in his speech at the General Debate of the 66th session of the United Nations General Assembly on 21 September 2011. As commander-in-chief of the Mongolian Armed Forces, Elbegdorj supports Mongolia's commitment and participation in United Nations Peacekeeping operations. Since 2001, Mongolian troops have participated in international peacekeeping missions in Iraq, Sierra Leone, South Sudan, Ethiopia, Congo, Eritrea, Chad, Darfur, Western Sahara, Georgia, and Afghanistan. Under Elbegdorj's presidency, Mongolia became one of the top 20 peacekeeping contributors to the United Nations peacekeeping missions in 2009. Elbegdorj visited South Sudan to encourage Mongolian soldiers on 15 February 2013. "Elbegdorj's visit was the first to South Sudan by a head of state from outside Africa. His visit is also the first from a country contributing troops to the UN mission," Hiruy Amanuel, chief political affairs representative at UNMISS said. As an officer in the Mongolian Armed Forces, Elbegdorj's son Erdene Elbegdorj participated in the United Nations peacekeeping mission in South Sudan from March to November 2013. In addition, as an active member of the UN peacekeeping missions, "Mongolia stands committed to enhancing its contribution, including through hosting training for civil police and medical personnel at its training center," Elbegdorj stated at the General Debate of the 64th session of the United Nations General Assembly on 28 September 2009. Analysing the role of peacekeeping in Mongolia's military strategy, Christopher Pultz mentions in his article the related "third neighbours" policy of the President: "Mongolia is developing a unique military strategy that attempts to balance conventional and peacekeeping capabilities. Having moved away from its previous security arrangements with Russia, Mongolia now pursues a foreign policy that will facilitate global engagement while allowing the country to maintain its sovereignty, national identity, and diplomatic freedom of maneuver through a “third neighbor” policy. In an interview film with the President (titled "Mongolia – Democratic Anchor of the East"), Elbegdorj explains the same policy in details. About foreign investment policy, Elbegdorj stated "I stand open to cooperate with responsible, transparent and law-obedient investors aligned with the development interests of Mongolia," in his inaugural address for his second term as the country's President on 10 July 2013. Furthermore, while speaking about judicial reforms to protect domestic and foreign investors, Elbegdorj said "Our goal is to change it from a system that serves those in power to one that serves the public. It is important to note that when we say 'the people' we are also referring to our foreign investment partners." The United States Senate passed Resolution Number 208 on the occasion of Elbegdorj's visit to the United States on 15 June 2011. The resolution title is "Expressing the sense of the Senate regarding Mongolian President Tsakhiagiin Elbegdorj's visit to Washington, D.C., and its support for the growing partnership between the United States and Mongolia." The resolution noted "Whereas on May 24, 2009, the people of Mongolia completed the country's fourth free, fair, and peaceful democratic election, which resulted in the election of opposition Democratic Party candidate Tsakhiagiin Elbegdorj." The Senate's resolution resolved "It is the sense of the Senate that Mongolian President Tsakhiagiin Elbegdorj's historic visit to Washington, D.C. cements the growing friendship between the governments and peoples of the United States and Mongolia; the continued commitment of the Mongolian people and the Government of Mongolia to advancing democratic reforms, strengthening transparency and the rule of law, and protecting investment deserves acknowledgment and celebration." Elbegdorj initiated and co-hosted with the World Economic Forum "Fair Mineral Development" roundtable in Ulaanbaatar in June 2010. It was the first multi-stakeholder meeting in the mineral resource rich country focusing on determining the key stakeholders for negotiating mineral development agreements, and decision-making authorities in the licensing negotiation process; transparency issues in the negotiation process; issues related to land tenure, royalties and taxes; reopening and renegotiation of mineral agreements; dispute resolution mechanisms; and revenue distribution, work force and community development. With the World Economic Forum, Elbegdorj co-organized second roundtable "Responsible Mineral Development Initiative" in the Citizens' Hall under the Office of the President of Mongolia during the Mongolia Economic Forum on 3–4 March 2011. "More and more mineral development agreements are expected for Mongolia in this century," Elbegdorj noted in his opening remarks at this second roundtable. He highlighted "Supporting sustainable development and making the minerals sector beneficial to the people and the country's development, while working in good cooperation with foreign investors, and making the government's operations transparent to the public are some of the issues of utmost concern for countries such as ours." Nearly complete eight feet tall and 24 feet long rare Tarbosaurus T. bataar dinosaur's skeleton scavenged from Mongolia was announced to be auctioned at Heritage Auctions in New York City on 20 May 2012 with asking price of one million dollars. Fossils found in Mongolia are the property of Mongolia and its people by law. Receiving a complaint from a Mongolian paleontologist, Elbegdorj promptly filed a lawsuit claiming the illegally smuggled skeleton from Mongolia in the United States Court through his American lawyer. Elbegdorj won the case with the professional help of internationally well known American and Mongolian paleontologists. The U.S. authorities handed the fossils to the Mongolian party in May 2013 after the case was resolved. The skeleton along with other dinosaur fossils those returned together to Mongolia was on display to public on main Sükhbaatar Square in Ulaanbaatar for a few months. This is the first lawsuit ever claimed abroad by a Mongolian president. The dinosaur fossil dealer pleaded guilty and faced sentencing of up to 17 years in prison in the USA. Elbegdorj's presidential actions have focused on advocating anti-corruption measures. "I sincerely believe that the true enemy of democracy and freedom is corruption ... The worst theft is corruption which damages people's common rights and liberties ... I am convinced that fighting corruption must be one of the most important duties of the Mongolian State today," Elbegdorj noted. Previously, during his two terms as a prime minister, he worked to uncover and eliminate several corruption scandals including his handling of the Erdenet Mining Corporation's embezzlement scandal in 1998, and his administration dug out the Customs chairman's corruption case in 2005. In September 2009 Elbegdorj replaced the Community Council of Independent Authority Against Corruption (IAAC) formed by former President Nambaryn Enkhbayar which included sports and music stars and supreme clergy while expressing his dissatisfaction with its investigation of petty corruption instead of political level corruption. He then reorganized the council with professional lawyers. To create a dialogue among different stakeholders in the natural resources and mining community to stop corruption Elbegdorj opened a roundtable in Ulaanbaatar in collaboration with the World Economic Forum's Partnering Against Corruption Initiative (PACI) in March 2011. The meeting brought together top executives of Mongolian industries and NGOs to discuss anti-corruption initiatives in Mongolia. Moreover, he encouraged the parliament to take actions to prevent from corruption and jointly organized with the parliament's State Standing Committee and the International Institute for Democracy and Electoral Assistance "Policy Reform and the Funding of Political Activities" forum. Elbegdorj sees Chinggis Khaan (also referred to as Genghis Khan) as a leader from whom to learn for anti-corruption efforts. He said that Genghis Khan sought equal protection under the law for all citizens regardless of status or wealth. "Chinggis ... was a man who deeply realized that the justice begins and consolidates with the equality of law, and not with distinctions between people. He was a man who knew that good laws and rules lived longer than fancy palaces," Elbegdorj highlighted in his speech on the 850th anniversary of Chinggis Khaan's birth. "The crime called corruption is committed by public servants, and not citizens," Elbegdorj pointed out at the High-Level Meeting on the Rule of Law of the 67th session of the United Nations General Assembly on 24 September 2012. "Today we put an end to ... amorality. We cannot afford to let Mongolia's future be tortured by corrupt officials for another year, another decade ... We must put an end to this," Elbegdorj pointed out in his first inaugural address. Thus under Elbegdorj's presidency, embezzlement and corruption cases amounting from millions to hundreds of millions of dollars, ranging from misappropriation of state properties and assets such as a printing factory, buildings, funds and taxes have been tried and the courts convicted high level statesmen including a former president of Mongolia, a former chairman of Mineral Resources Authority, ex-chairmen of state owned Mongolian Airlines MIAT and their allies. In addition, big scale corruption cases involving suspects such as former health and education ministers, former deputy chairman of Tax Authority are under investigation. Mongolia's corruption perception ranking reduced by 26 places in one year from 2011 to 2012 comparing to the 120th place to the 94th according to Transparency International. U.S. Secretary of State Hillary Clinton applauded Elbegdorj and Mongolia on the country's democratic progress and efforts to end corruption in her speech at the International Women's Leadership Forum in Ulaanbaatar on 9 July 2012. By the Constitution of Mongolia, the President of Mongolia appoints the justices and judges of all levels of courts of Mongolia. Elbegdorj convened "Judicial Reform and Justice" Forum in Ulaanbaatar, Mongolia in April 2011. Mongolian parliament passed a package law on judicial reform submitted by Elbegdorj in 2011. Those laws designed to ensure impartiality of judges and justices and created a merit-based system for the selection of new judges and justices. In addition, the judicial reform allows citizens' representatives to participate in court hearings and trials and requires that all judicial decisions be placed on internet open for public. The United Nations Environmental Programme awarded Elbegdorj as a Champion of the Earth for his commitment to environmental protection on 4 June 2012. U.N. Secretary General Ban Ki-moon highly appreciates Elbegdorj's contribution to the international community's efforts for ensuring sustainable development and keeping climate change issues under control, as he emphasized in his congratulatory note to Elbegdorj for his re-election as President of Mongolia on 2 July 2013. In addition, Elbegdorj worked as a member of the World Economic Forum's Global Agenda Council on Climate Change for the year of 2011. Elbegdorj declared a day as Tree Planting Day by decree on 4 April 2010 and has been organizing a tree planting campaign around the country. On that day organizations and people plant trees to alleviate desertification in Mongolia. Many non-governmental organizations and social networks support Elbegdorj's call to plant trees. He ordered schools to have environmental subjects in schools' curricula. With support from his office, students began to plant and take care of trees they planted around their schools and television serials on planting trees have been broadcast. On 14 May 2011, Tree Planting Day, Mongolians planted two million trees. The event became a tradition of planting two million trees on every Tree Planting Day annually. In addition, his policy includes environmentally friendly policy in mining industry. At the invitation of Elbegdorj, the World Economic Forum-Water Resources Group and Office of the President of Mongolia co-organized the Water Secure Future in Mongolia conference in Ulaanbaatar on 3 June 2011 in which over 100 government officials, parliamentarians, civil society and private sector representatives participated to find ways to safeguard Mongolia's scarce water resources in the context of its rapid economic growth. They discussed about water use in the mining, agricultural and municipal sectors, shared case studies of international good practice for boosting water efficiency and ways of safeguarding Mongolia's water supplies. As a result, Elbegdorj and Peter Brabeck-Letmathe, Chairman of the World Economic Forum-Water Resources Group and Member of the World Economic Forum Foundation Board, committed to form a Mongolian Water Alliance of key government entities, civil society representatives and private sector participants to support the transformation of Mongolia's water sector. Elbegdorj defined the purpose of the alliance by saying "Managing our future water needs is key to sustaining Mongolia's economic growth. We must ensure fast and effective implementation of our National Water Plan. We will benefit from the international networks and experience of the Water Resources Group to help us do so." President Elbegdorj took part in the United Nations Climate Change Conference (COP21), in Paris, France. He delivered remarks at the Conference. Heads of State and Government of 195 countries, more than 50 thousand representatives of civil society and private sector have gathered for the Climate Change Conference which will be held in Le Bourget, from November 30 to December 11, 2015. Introduce information technologies to streamline and modernize government. On 20 May 2013, Elbegdorj issued a decree that directed the government to provide financial support to Mongolian students to study at the world's top universities. By the implementation of the decree, Mongolian students accepted at the world's top 20 universities will receive funding from the government regardless of their major, and those accepted at the world's top 100 universities will be financed by the government if their major is included in the government's preferred profession list. Elbegdorj vetoed a section of a law amendment that would have increased his salary; in return, he submitted a bill to the Parliament to give allowance as salary from government to all Mongolian students studying in Mongolia. The law was passed and all Mongolian students studying at any university or college in Mongolia have received monthly allowances of 70,000 tugrugs since 2011 and the allowance may be increased to 96,000 tugrugs as per government decision in September 2013. Elbegdorj was a member of the board of directors of "Young Leader" foundation of Mongolia in 1992–2009 and a member of the director's board of the Mongolian Academy of Political Education in 1993–2009. Elbegdorj has been calling for a curb on the abuse of alcohol in Mongolia. Under his auspices and in collaboration with his office, civil society and non-governmental organizations organized many activities such as the Alcohol-Free Mongolia campaign. Elbegdorj banned the use of all alcoholic beverages at state dinners and state ceremonies under his name. Also he called upon government and its agencies not to serve alcohol at official ceremonies and functions. The World Health Organization awarded Elbegdorj its Regional Director's special recognition plaque. The award honors the public health leadership of a country leader and it is the first award for alcohol control in the Western Pacific Region. When Mongolia's population officially reached 3 million with the birth of a baby girl in Umnugobi province in February 2015, President Elbegdorj welcomed the news with a cheer, personally calling the parents to congratulate the new-born citizen. As a symbol of unity and harmony, Elbegdorj kindly asked the parents to name their daughter Mongoljin. "Man of the People", historical portrait documentary film with President Elbegdorj, about the democratic transition in Mongolia. November, 2014. "The Democratic Anchor of the East", President Elbegdorj is interviewed about the foreign policy of Mongolia. June, 2015. "On The Road of Democracy - Regional Co-operation in Asia" , documentary film about the role of Mongolia in its region through the eyes of international experts and the President of Mongolia, Tsakhiagiin Elbegdorj. March, 2016. Amanpour, Christiane (25 September 2012). What's the fastest growing economy in the world?. CNN. Retrieved 23 June 2013. Frohm, Stuart (15 September 2004). Mongol Khan-Quest. Mackinac Center for Public Policy. Retrieved 23 June 2013. Evans, Peter & Helen (March/April 2004). One Year Toward Freedom – part 1, part 2, part 3, part 4, renewamerica.us. Retrieved 23 June 2013. Communism to Democracy: Lessons from Mongolia on the Eve of the Election Campaign, webcast of the talk. The Heritage Foundation. 30 May 2003.
video of address of Mr. Tsakhia Elbegdorj at the 64th Session of the United Nations General Assembly (part 2). youtube.com. 28 September 2009. Retrieved 1 August 2013. Address to the People of Japan by President Elbegdorj, delivered at the National Diet of Japan on December 18, 2010. Address by H.E. President Elbegdorj Tsakhia, Mongolia to the General Debate of the 66th Session of the United Nations General Assembly. un.org. 21 September 2011. Retrieved 23 June 2013. Speech of The President of Mongolia, Ts.Elbegdorj at the Bundestag during His Official Visit to Federal Republic of Germany on March 31, 2012. Mongolian President Elbegdorj's speech delivered at an honorary session of the Parliament of the Kyrgyz Republic, the Jogorku Kenesh, on April 3, 2012.
video of A Public Address by His Excellency Tsakhiagiin Elbegdorj, President of Mongolia. Harvard Kennedy School's Institute of Politics. 21 September 2012. Retrieved 1 August 2013. (video copy at youtube.com). Statement by H.E. Mr.Elbegdorj Tsakhia, President of Mongolia at the United Nations General Assembly's High-Level Meeting on the Rule of Law. United Nations. 24 September 2012. Retrieved 1 August 2013. New York Democracy Forum Dinner: Tsakhia Elbegdorj text, video Foreign Policy Association. 25 September 2012. Retrieved 25 June 2013. The President of Mongolia Gives Lecture at Yangon University on November 20, 2013. Statement by the President of Mongolia at the General Debate of the 67th session of the United Nations General Assembly. president.mn. 27 September 2012. Retrieved 1 August 2013. North Korea lecture at Kim Il Sung University by President of Mongolia Tsakhiagiin Elbegdorj. World News. 2 Nov 2013. Retrieved October 27, 2014. "It Is the Human Desire to Live Free That Is an Eternal Power" lecture at Kim Il Sung University by President of Mongolia, 31 October 2013. Elbegdorj met Khajidsuren Bolormaa at a Mongolian students' party in Lviv, Ukraine when they were students. After their marriage in Ulaanbaatar, their first son was born in Lviv, Ukraine. They helped over 300 orphans through their Bolor Foundation. They adopted twenty children from the state run Orphan Care Center (orphanage) in Ulaanbaatar after being the children's patrons for some time. Now they have twenty five children: four sons of their own and twenty one adopted children. Elbegdorj became the first president to dive to the bottom of the world's deepest lake, Baikal, in the Mir-1 mini-submersible on 16 July 2010. "Elbegdorj is a risk-taker and puts others' needs before his own. A long-time (U.S.) Embassy employee recalled Elbegdorj accompanying the embassy officials on a trip to deliver humanitarian assistance to the countryside during a winter disaster in the 1990s. The road was snowed under, and Elbegdorj volunteered to go ahead to check for alternate routes, despite freezing conditions and deep snow," a U.S. Ambassador to Mongolia described Elbegdorj in his confidential wire to the U.S. authorities that was leaked to Wikileaks. Due to being president, in 2012 Elbegdorj asked his elder brother Arslandorj to give up from his new position as a director of City Landscaping Department of Ulaanbaatar City though Arslandorj had worked there for more than 20 years before his brother's presidency. Long time Democratic Party member Arslandorj quit his career at his brother's request. Arlsandorj is upset about stopping his professional career due to his brother's top political position. Arslandorj said: "As a brother, I followed to protect and helped Elbegdorj in difficult times, when Elbegdorj was facing life threatening risks during his co-organizing and co-leading the 1990 Mongolian democratic revolution." Arslandorj said that he would establish a private company specialized in his profession in future. Also Elbegdorj tweeted announcing his job search in Mongolia for his eldest son Orgil who got Ph.D. in medicinal chemistry from Virginia Commonwealth University in the United States. The son got a job at a private pharmaceutical company in Mongolia later. Elbegdorj's second son Erdene works in the Mongolian Armed Forces and served in the United Nations peacekeeping mission in South Sudan from March to November 2013. ↑ "Mongolia's Former Communist Party MPRP Pulled the Rug Under Elbegdorj's Government". PR Web. 13 January 2006. Retrieved 21 May 2009. ↑ "Elbegdorj: From freedom fighter to Mongolian statesman". Retrieved 7 January 2014. ↑ B., Unurtogtokh (10 July 2013). "Ts.Elbegdorj's work evaluated and "task" was given to him to finish what he began to implement". mminfo.mn (in Mongolian). Retrieved 10 August 2013. 1 2 "Elbegdorj, Tsakhiagiin". Facts on File. Retrieved 25 June 2013. ↑ "Tsakhiagiin Elbegdorj "The Pioneer of Mongolian Democracy"". Mongolia-web.com. 11 July 2007. Retrieved 29 June 2013. ↑ "Asia Foundation Hosts His Excellency President Elbegdorj of Mongolia". Asia Foundation. 14 June 2011. Retrieved 29 June 2013. 1 2 "At General debate, Mongolia's President calls for more women in leadership positions". UN News Centre. 27 September 2012. Retrieved 29 June 2013. ↑ Namjilsangarav, Ganbat (27 June 2013). "Mongolian leader re-elected on anti-graft agenda". The Boston Globe. Boston, MA. Retrieved 29 June 2013. ↑ "Mongolia leader calls for end to death penalty". BBC. 14 January 2010. Retrieved 29 June 2013. 1 2 B, Ganchimeg (13 February 2013). "Ts.Elbegdorj: Key achievement of past four years is – Sustainability". politics.time.mn(in Mongolian). Ulaanbaatar. Retrieved 21 June 2013. ↑ Mongolian Writers: Tsakhiagiin Elbegdorj, Galsan Tschinag, Byambyn Rinchen. Memphis, TN: Books LLC. 2010. ISBN 978-1-156-04384-4. Retrieved 8 July 2013. ↑ "Elbegdorj Tsakhia, President of Mongolia, Head of the National Security Council". National Security Council of Mongolia. Retrieved 8 July 2013. ↑ "Biographical Summary For Mongolian President-elect Elbegdorj". cablegatesearch.net. 4 June 2009. Retrieved 29 June 2013. ↑ "History of Academy". Army Academy named after hetman Petro Sahaydachyi. Retrieved 30 June 2013. ↑ Brooke, James (25 December 2004). "The Saturday Profile; A Mongolian and His Nation, Evolving Together". The New York Times. New York. Retrieved 22 June 2013. ↑ "Mongolia President Elbegdorj arrives in Lviv to start state visit". Ukraine Business Online. 28 June 2011. Retrieved 30 June 2013. 1 2 "The New York Democracy Forum: Mongolian President Tsakhia Elbegdorj, Kyrgyz President Roza Otunbayeva". National Endowment for Democracy. 22 September 2011. Retrieved 29 June 2013. ↑ Oduha, Joseph (13 February 2013). "President of Mongolia Visits South Sudan". The Christian Times. Juba. Retrieved 29 June 2013. 1 2 Page, Susan (19 January 2011). "Reagan inspired Mongolia's president to seek democracy". USA Today. McLean, VA. Retrieved 7 July 2013. 1 2 "Heads of State". Harvard University. Retrieved 6 July 2013. ↑ Talan, Scott (24 September 2012). "Kennedy School graduate guides Mongolia into new era". Harvard Kennedy School. Retrieved 6 July 2013. 1 2 3 Desai and Kaufman, Sagar and David W. (5 January 2005). "Mongolian President Talks Corruption And Human Rights". The Harvard Crimson. Cambridge, MA. Retrieved 21 June 2013. ↑ "Interview with Akim Gotov (in Mongolian)". The Oral History of Twentieth Century Mongolia, University of Cambridge. Retrieved 8 July 2013. ↑ "Transcript of interview with Khaidav Sangijav" (PDF). Civic Voices. p. 6. Retrieved 8 July 2013. ↑ Tseveen and Ganbold, Odgerel and Battsetseg (January 2006). "The Mongolian legal system and laws: a brief overview". GlobaLex. New York. Retrieved 8 July 2013. ↑ "Elbegdorj, Tsakhiagiin". National Digital Heritage Academy (in Mongolian). Retrieved 8 July 2013. ↑ S., Bayar (22 March 2013). "Ch.Enkhee: Special western agencies financially supported". Tsag Tur(Time and the country) (in Mongolian). Ulaanbaatar. Retrieved 8 July 2013. ↑ M., Gal. "What are the "First 13 of Democracy" doing?". Humuus (People) (in Mongolian). Ulaanbaatar. Retrieved 8 July 2013. ↑ Sanders, Alan J.K. (2010). Historical Dictionary of Mongolia. Third edition. Lanham, MD: Scarecrow Press. p. 230. ISBN 978-0-8108-7452-7. Retrieved 25 June 2013. ↑ "Transcript of interview with Khaidav Sangijav" (PDF). Civic Voices. p. 5. Retrieved 8 July 2013. ↑ G., Dari (5 December 2011). "Democracy Days to be inaugurated". news.mn (in Mongolian). Retrieved 8 July 2013. 1 2 "Tsakhia Elbegdorj". Community of Democracies Mongolia. Retrieved 8 July 2013. ↑ S. and S., Amarsanaa & Mainbayar (2009). Concise Historical Album of the Mongolian Democratic Union. pp. 10, 19. 1 2 Ahmed and Norton, Nizam U. and Philip (1999). Parliaments in Asia. London: Frank Cass & Co.Ltd. p. 143. ISBN 0-7146-4951-1. Retrieved 8 July 2013. ↑ Baabar (16 November 2009). "Democratic Revolution and Its Terrible Explanations". baabar.mn (in Mongolian). Retrieved 25 June 2013. 1 2 "Democracy's Hero: Tsakhiagiin Elbegdorj". Washington: The International Republican Institute. 21 July 2011. Retrieved 8 August 2012. ↑ "Mongolia Celebrates 20th Anniversary of Democratic Revolution". The International Republican Institute. 11 December 2009. Retrieved 8 August 2012. ↑ Wilhelm, Kathy (12 March 1990). "Mongolian Politburo resigns en masse". The Free Lance Star. Fredericksburg, VA. p. 4. Retrieved 8 July 2013. ↑ "Entire Mongolian Politburo resigns". Lawrence Journal-World. Lawrence, KS. 12 March 1990. pp. 8A. Retrieved 8 July 2013. ↑ Ch., Munkhbayar (13 March 2013). "What was the Mongolian democratic revolution?". dorgio.mn (in Mongolian). Retrieved 8 July 2013. ↑ Gamba, Ganbat (2004). "The Mass Public and Democratic Politics in Mongolia" (PDF). Taipei: Asian Barometer. p. 3. Retrieved 8 July 2013. 1 2 Sanders, Alan J.K. (2010). Historical Dictionary of Mongolia. Third edition. Lanham, MD: Scarecrow Press. p. 209. ISBN 978-0-8108-7452-7. Retrieved 25 June 2013. ↑ "Ts.Elbegdorj". tsagaandarium.org. Retrieved 29 June 2013. ↑ Colonel P., Byambasuren (23 June 2013). "Office Elbegdorj whom I know". 24tsag.mn (in Mongolian). Retrieved 8 July 2013. 1 2 "Biographical summary for Mongolian President-elect Elbegdorj". wikileaks.org. 4 June 2009. Retrieved 29 June 2013. 1 2 3 "Mongolia President Elbegdorj arrives in Lviv to start state visit". Ukraine Business Online. 28 June 2011. Retrieved 25 June 2013. ↑ Ireland, Michael (18 October 2005). "Christian-owned Eagle television being broadcasting on Channel 8 in Mongolia". Across Pacific. Honolulu, HI. Retrieved 7 July 2013. ↑ "President of Mongolia". planetrulers.com. 10 April 2010. Retrieved 8 July 2013. ↑ Anderson, Lindsay Hodges (Winter 2010). "From the Field: A New Democracy, Elbegdorj Tsakhia MC/MPA 2002". Harvard Kennedy School Magazine. Cambridge, MA. Retrieved 21 June 2013. 1 2 3 "Constitution of Mongolia". World Intellectual Property Organization. 13 January 1992. Retrieved 25 June 2013. ↑ Miller, Vincent H. "From Communism to Capitalism in the Land of Genghis Khan". Retrieved 29 June 2013. ↑ Lawrence, Susan V. (14 June 2011). "Mongolia: Issues for Congress" (PDF). Congressional Research Service. Retrieved 25 June 2013. 1 2 "Mongolian new president". e-mongolia.blogspot.com. 21 June 2009. Retrieved 3 July 2013. ↑ Sanders, Alan J.K. (2010). Historical Dictionary of Mongolia. Third edition. Lanham, MD: Scarecrow Press. p. 231. ISBN 978-0-8108-7452-7. Retrieved 3 July 2013. ↑ "Mongolian President Tsakhiagiin Elbegdorj's brief biography". wisdomklub.miniih.com (in Mongolian). 14 September 2009. Retrieved 7 July 2013. 1 2 Pocha, Jehangir S. (27 May 2005). "Mongolians test alien idea: Privatizing the land". The New York Times. New York. Retrieved 7 July 2013. ↑ Ch., Bolor (9 September 2008). "Around Fourteen Thousand Monks Were Persecuted". gogo.mn (in Mongolian). Retrieved 21 May 2009. ↑ "President of Mongolia Ts.Elbegdorj". Asia Pacific Securities. Retrieved 25 June 2013. ↑ "Canadian & US official delegations attend inauguration of President Elbegdorj; US Senate unanimously passes pro-Mongolia resolution on the same day". North America- Mongolia Business Council. 18 June 2009. Retrieved 25 June 2013. ↑ "April 1998". rulers.org. April 1998. Retrieved 21 May 2009. ↑ "Mongolian Law on Privatizing Dissolved Ardiin erkh (Daily News) and Zasgiin gazriin medee (Government News) newspapers". legalinfo.mn. 22 January 1999. Retrieved 7 July 2013. ↑ CA, Jeff (31 January 2013). "Comment on SouthGobi Executive Under Exit Ban". Seeking Alpha. Retrieved 25 June 2013. ↑ Kohn, Michael (10 June 2003). "Mongolian Christian TV Station Shuts Down". New York. Associated Press. Retrieved 30 June 2013. 1 2 3 4 Baabar (2009). "Year of 98-Continuing". Mongolians: Movement and Settlement (in Mongolian). 5. Ulaanbaatar: Nepko. Retrieved 7 July 2013. ↑ Baabar (2009). "Year of 98-Part 3". Mongolians: Movement and Settlement (in Mongolian). 5. Ulaanbaatar: Nepko. Retrieved 7 July 2013. ↑ Baabar (2009). "Year of 98-Part 2". Mongolians: Movement and Settlement (in Mongolian). 5. Ulaanbaatar: Nepko. Retrieved 7 July 2013. ↑ Sanders, Alan J.K. (2010). Historical Dictionary of Mongolia. Third edition. Lanham, MD: Scarecrow Press. p. xviii. ISBN 978-0-8108-7452-7. Retrieved 25 June 2013. ↑ D., Oyun (12 June 2013). "Youth of Tuv province hands over 1000 letters supporting the Democratic President". olloo.mn (in Mongolian). Retrieved 7 July 2013. ↑ Kohn, Michael (2006). Dateline Mongolia: An American Journalist in Nomad's Land. Muskegon, MI: RDR Books. p. 109. ISBN 978-1-57143-155-4. Retrieved 25 June 2013. ↑ "Ts.Elbegdorj". tsagaandarium.org. 2012. Retrieved 5 January 2014. ↑ "Mongolian President Discusses Personal Liberty in a Free Country at JFK Jr. Forum". Harvard Kennedy School. 24 September 2012. Retrieved 5 January 2014. ↑ Enkhtsag, Enerel (12 October 2012). "Output of Harvard (in Mongolian)". enerel.niitlelch.mn. Retrieved 5 January 2014. ↑ "Ts. Elbegdorj is Prime Minister (August 20, 2004)". Open Society Forum. 20 August 2004. Retrieved 7 July 2013. ↑ Zuckerman, Ethan (13 January 2006). "It is never too cold to riot in Ulaanbaatar". ethanzuckerman.com. Retrieved 25 June 2013. ↑ Bush, George W. (21 November 2005). "President Discusses Freedom and Democracy in Ulaanbaatar, Mongolia". U.S. Department of State. Retrieved 30 June 2013. ↑ Bush, George W. (5 December 2005). "Bush writes Elbegdorj". mongolia-web.com. Retrieved 1 July 2013. ↑ "Law on Public Radio and Televisions". legalinfo.mn (in Mongolian). 27 January 2005. Retrieved 9 July 2013. ↑ "Law on Rules of Demonstration and Public Gatherings. Its Article 7.2 that prohibited public demo on Sükhbaatar Sq. was voided on 17 November 2005". legalinfo.mn (in Mongolian). 7 July 1994. Retrieved 9 July 2013. ↑ "Mongolia and Burma". Congressional Record Online. 5 October 2004. p. Volume 150. Number 124. Senate. Page S10419. Retrieved 25 June 2013. ↑ "Report: Mongolia, Chapter: IV. Governance issues. Open Government". Privacy International. 12 December 2006. Retrieved 1 August 2013. 1 2 "Baatar's secret chairman seems Ch.Ulaan". tsag.mn (in Mongolian). 26 April 2012. Retrieved 23 June 2013. ↑ "Elections and Position of Parties". Onoodriin toim (Today's Briefing) (in Mongolian). Ulaanbaatar. 18 January 2008. Retrieved 21 May 2009. ↑ "Commission Decision of 21 December 2005". Official Journal of the European Union. Luxembourg. 21 December 2005. Retrieved 28 May 2009. ↑ "Prime Minister Elbegdorj's speech". Union of Mongolian Students in South Korea (in Mongolian). 3 October 2005. Retrieved 8 July 2013. ↑ Brooke, James (15 February 2005). "For Mongolians, E Is for English, F Is for Future". The New York Times. New York. Retrieved 22 June 2013. ↑ "For the 800th anniversary of Great Mongol Empire ...". Union of Mongolian Students in South Korea. 26 December 2005. Retrieved 8 July 2013. ↑ "Mongolian nature and environment legislative scorecard. Fall 2008 and Spring 2009 Parliamentary sessions" (PDF). Mongolian Environmental Protection Civil Movements' Coalition. 2009. Retrieved 22 June 2013. ↑ Bormann, Renate (August 2005). "Aktuelle Nachrichten aus der Mongolei". Bonn: mongolei.de (in German). Retrieved 22 June 2013. ↑ "In Mongolia protest groups collide". Mongolia-web.com. 12 April 2006. Archived from the original on 20 February 2007. ↑ "Mongolia Country Report". Global Finance. Retrieved 30 June 2013. ↑ "Presidential election May, 2009". Business-Mongolia.com. 4 April 2009. Retrieved 7 July 2013. ↑ Schrapel, Thomas (2009). "Report on the Presidential elections in Mongolia on May 24, 2009" (PDF). Auslandsinformationen. 5–6. Berlin. pp. 169–173. ISSN 0177-7521. Retrieved 7 July 2013. ↑ "Mongolia Profile". BBC. Retrieved 31 July 2012. 1 2 "Mongolia's new president sworn in". euronews.com. 18 June 2009. Retrieved 25 June 2013. ↑ "Democratic Party's National consultative committee's 42nd convention supports Elbegdorj's candidacy 100%". Odriin sonin (Daily News) (in Mongolian). 7 May 2013. Retrieved 29 June 2013. ↑ B., Mandakh (8 May 2013). "Congress of Democratic Party taken place". news.mn (in Mongolian). Retrieved 29 June 2013. ↑ E, Dari (27 May 2013). "The unique features of the 6th Presidential Election of Mongolia". UB Post. Ulaanbaatar. Retrieved 21 June 2013. ↑ "Motherland Party and Republican Party are to support Ts.Elbegdorj". vip76.mn (in Mongolian). 29 May 2013. Retrieved 22 June 2013. ↑ D., Tsetseg (27 June 2013). "It is announced that Ts.Elbegdorj won by preliminary result". shuud.mn (in Mongolian). Retrieved 27 June 2013. ↑ "Incumbent Mongolian president wins 2nd term on pro-Western, anti-graft platform". The Washington Post. Washington. 27 June 2013. Retrieved 29 June 2013. 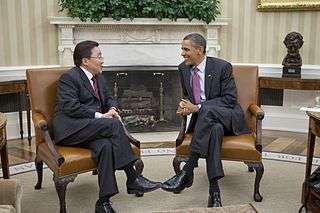 ↑ "Obama on Presidential Election in Mongolia". U.S. Department of State. 27 June 2013. Retrieved 1 July 2013. ↑ "Statement by President on the Presidential Election in Mongolia". U.S. Department of State. 27 June 2013. Retrieved 1 July 2013. ↑ "UNGA President congratulates Ts.Elbegdorj". Montsame News Agency. 27 June 2013. Retrieved 1 July 2013. 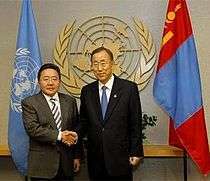 ↑ "UN Secretary General Ban Ki-moon congratulates the President of Mongolia Ts.Elbegdorj". infomongolia.com. 3 July 2013. Retrieved 6 July 2013. ↑ "José Manuel Barroso sends greetings". news.mn (in Mongolian). 28 June 2013. Retrieved 1 July 2013. ↑ B., Khuder (4 July 2013). "German Chancellor congratulates Elbegdorj". Montsame News Agency. Retrieved 6 July 2013. 1 2 3 Khuder (10 July 2013). "Ts.Elbegdorj takes oath". Montsame News Agency. Retrieved 10 July 2013. ↑ "Tsakhiagiyn Elbegdorj". globalsecurity.org. Retrieved 22 June 2013. ↑ "Mongolia's new president fights corruption". NDTV. 19 June 2009. Retrieved 28 July 2013. ↑ "S.RES.192 – Expressing the sense of the Senate regarding supporting democracy and economic development in Mongolia and expanding relations between the United States and Mongolia". The Library of Congress. 18 June 2009. Retrieved 25 June 2013. 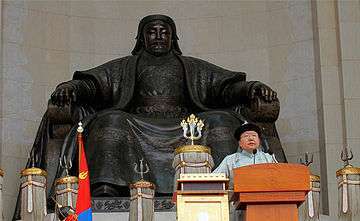 ↑ "Mongolia's President Elbegdorj takes oath at his inauguration after being re-elected, in front of the statue of Genghis Khan in Ulan Bator". allvoices.com. 10 July 2013. Retrieved 28 July 2013. ↑ B., Enkhmaa (10 July 2013). "Ceremonial Parliamentary session concluded". news.mn (in Mongolian). Retrieved 10 July 2013. ↑ "President to be sworn in on 10th in front of Genghis Khan monument". shuud.mn (in Mongolian). 3 July 2013. Retrieved 6 July 2013. ↑ B., Khuder (13 July 2013). "President receives Lech Walesa". MONTSAME News Agency. Retrieved 28 July 2013. ↑ "2012 Laureate: Policy Leadership: President Tsakhia Elbegdorj, Mongolia". The United Nations Environmental Programme. 4 June 2012. Retrieved 25 June 2013. ↑ Burns, William J. (29 April 2013). "Deputy Secretary of State William J. Burns:Remarks at the Community of Democracies Ministerial". humanrights.gov. Retrieved 25 June 2013. ↑ "VII Ministerial Conference of the Community of Democracies". Community of Democracies Mongolia. April 2013. Retrieved 20 June 2013. ↑ "Ulaanbaatar Declaration "Community's Attainments and Global Challenges"". Community of Democracies Mongolia. 29 April 2013. Retrieved 25 July 2013. ↑ "General Debate of the 66th Session: Mongolia H.E. President Elbegdorj Tsakhia's Statement". General Assembly of the United Nations. 21 September 2011. Retrieved 25 July 2013. 1 2 "President Elbegdorj chairs GC of Community of Democracies". Embassy of Mongolia. 22 September 2011. Retrieved 22 June 2013. ↑ "History and Mission". The Community of Democracies. Retrieved 31 July 2012. ↑ "North Korea lecture at Kim Il Sung University by President of Mongolia Tsakhiagiin Elbegdorj". ↑ "Die Mongolen vergessen die Hilfe anderer nicht". Deutscher Bundestag. 30 March 2012. Retrieved 5 January 2014. ↑ Norovsambuu & Munkhbat, Ariunaa & Naran (8 May 2013). "Daw Aung San Suu Kyi Speaks with Mongolian Youth". In Asia. Retrieved 29 June 2013. ↑ "Transcripts of the Speech by Daw Aung San Suu Kyi at a public lecture held jointly with President Tsakhiagiin Elbegdorj in Ulaanbaatar, 30 April 2013". president.mn. 30 April 2013. Retrieved 21 June 2013. ↑ "Ts.Elbegdorj meets Aung San Suu Kyi". en.montsame.mn. Retrieved 2016-07-05. ↑ "President Tsakhiagiin Elbegdorj". president.mn. Retrieved 21 June 2013. ↑ "Mongolia for the Partnership for Democracy". infomongolia.com. 15 February 2012. Retrieved 22 June 2013. ↑ "General Assembly of the United Nations. General Debate of the 67th Session. Mongolia.H.E. Mr. Elbegdorj Tsakhia, President. Statement summary". United Nations. 27 September 2012. Retrieved 1 August 2013. ↑ Tsakhia, Elbegdorj (27 September 2012). "Empower the People, Not the Government. Build Opportunities, Not Statues". Office of the President of Mongolia. Retrieved 21 June 2013. ↑ Gershman, Carl (22 September 2011). "New York Democracy Forum Dinner:Carl Gershman, September 22, 2011" (PDF). Foreign Policy Association. Retrieved 22 June 2013. ↑ "From slavery to freedom in the land of Genghis Khan". International Society for Individual Liberty. September 2007. Retrieved 31 July 2012. ↑ Harding, Andrew (6 September 2011). "Citizen's Hall Mongolia". participedia.net. Retrieved 9 July 2013. 1 2 3 Tsakhia, Elbegdorj (18 June 2009). "Inaugural address to the nation". president.mn. Retrieved 31 July 2013. 1 2 "President's approved policy document to decentralize through direct democracy and civic participation and measure to implement it supported". sonin.mn (in Mongolian). 20 September 2012. Retrieved 25 July 2013. ↑ D., Oyun (27 May 2011). "Local power to be increased". news.mn (in Mongolian). Retrieved 25 July 2013. ↑ "It is possible to increase local administration power with civic participation". president.mn (in Mongolian). 27 May 2011. Retrieved 25 July 2013. ↑ "Swiss scholar addresses students". news.mn. 31 May 2011. Retrieved 25 July 2013. ↑ "Lecture about democracy in Switzerland was given". infomongolia.mn. 30 May 2011. Retrieved 25 July 2013. ↑ Direct democracy-civic participation policy document's pamphlet (2 ed.). Ulaanbaatar: cityhall.gov.mn (in Mongolian). 25 February 2012. Retrieved 25 July 2013. ↑ "Mongolia is keen to learn from Swiss experience with direct democracy". Swiss Agency for Development and Cooperation. 10 September 2012. Retrieved 25 July 2013. ↑ D., Tsetseg (8 November 2012). "Swiss scholar addresses students". news.mn (in Mongolian). Retrieved 25 July 2013. ↑ N., Sanjaasuren (9 November 2012). "Local development fund to be established in every soums". news.mn(in Mongolian). Retrieved 25 July 2013. ↑ "Direct democracy-civic participation training begins from Tuv province". olloo.mn (in Mongolian). 2 November 2012. Retrieved 25 July 2013. ↑ "Address to the People of Japan by H.E. Tsakhia Elbegdorj, President of Mongolia delivered at the National Diet of Japan". president.mn. 18 November 2010. Retrieved 5 January 2014. ↑ Perlez, Jane (9 July 2012). "From Mongolia, Clinton Takes a Jab at China". The New York Times. New York. Retrieved 3 October 2012. ↑ Areddy, James T. (9 July 2012). "Clinton Praises Mongolian System". The Wall Street Journal. New York. Retrieved 3 October 2012. ↑ "Mongolian President meets Vietnamese students". The Voice of Vietnam. 22 November 2013. Retrieved 5 January 2014. ↑ "Mongolia President Tsakhia Elbegdorj 'wins second term'". BBC. 27 June 2013. Retrieved 9 July 2013. ↑ Sugirragchaa (21 November 2013). "Mongolian leader gives lecture at Yangon University". MONSTAME News Agency. Retrieved 5 January 2014. ↑ "Le président mongol veut abolir la peine de mort". Le Monde (in French). Paris. 14 January 2009. Retrieved 29 June 2013. 1 2 3 "Statement by H.E. Mr.Elbegdorj Tsakhia, President of Mongolia, at the United Nations General Assembly High Level Meeting on the Rule of Law at the national and international levels" (PDF). United Nations Rule of Law Unit. 24 September 2012. Retrieved 1 August 2013. ↑ Tsakhia, Elbegdorj (18 May 2010). "Greetings of the President of Mongolia Tsakhia to the delegates of the 5th international meeting of Ministers of Justice "From moratorium to abolition of the capital punishment-No justice without life"". Office of the President of Mongolia. Retrieved 21 June 2013. ↑ Ts., Khankhukhii. "Death penalty that caused wrangle". undesten.mn. Retrieved 7 July 2013. ↑ "Constitution of Mongolia. Article 33.1.8". parliament.mn. 13 January 1992. Retrieved 9 July 2013. ↑ Slowe, Rosie (20 August 2012). "The Fate Of The Death Penalty". UB Post. Ulaanbaatar. Retrieved 7 July 2013. ↑ Bat-Ochir, Bumbaa (28 February 2011). "Is it right or wrong to abolish death penalty? Why?". biznetwork.mn (blog in Mongolian). Retrieved 7 July 2013. ↑ "Abolish the death penalty in Mongolia". Amnesty International. 18 February 2010. Retrieved 10 July 2013. 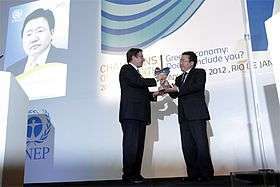 ↑ "'Abolitionist of the Year 2011' awarded to Mongolian President Elbegdorj". Hands off Cain. 17 October 2011. Retrieved 29 June 2013. ↑ "Mongolia takes 'vital step forward' in abolishing the death penalty". Amnesty International. 5 January 2012. Retrieved 8 August 2012. ↑ "Mongolian President Tsakhiagiin Elbegdorj visits European Parliament". European Parliament. Retrieved 2015-08-13. ↑ "PRESIDENT.MN". www.president.mn. Retrieved 2015-08-13. 1 2 "Inaugural address by Ts.Elbegdorj, President of Mongolia, at the ceremony of Presidential swearing into office". infomongolia.com. 10 July 2013. Retrieved 16 July 2013. ↑ "Mongolia Supports Kyrgyz Democratic Transformations". Community of Democracies. 11 April 2012. Retrieved 5 Jan 2014. ↑ "North Korea: 50.000 Football fans cheer Mongolian President Tsakhia ELBEGDORJ". World News. 2 Nov 2013. Retrieved 5 Jan 2014. ↑ Kaufman, Stephen (19 September 2012). "Mongolia's nuclear weapon free status recognized". U.S. Department of State. Retrieved 3 October 2012. ↑ Radojcic, Maja (21 June 2013). "President of the UN Assembly Vuk Jeremic visited Mongolia". In Serbia. Retrieved 24 June 2013. ↑ Karimi, Nasser (3 September 2012). "Iran opens nuclear site to Mongolia's president". Bloomberg Businessweek. Retrieved 23 June 2013. 1 2 3 Tsakhia, Elbegdorj (21 September 2011). "Statement by H.E. Mr.Elbegdorj Tsakhia, President of Mongolia, at the General Debate of the 66th session of the United Nations General Assembly". president.mn. Retrieved 31 July 2013. ↑ "Peacekeeping operations". The United Nations. Retrieved 24 June 2013. ↑ "Mongolia marks International Day of UN peacekeepers". Global Times. Beijing. 28 May 2013. Retrieved 30 June 2013. 1 2 Tsakhia, Elbegdorj (28 September 2009). "Mr. Tsakhia Elbegdorj at the 64th Session of the United Nations General Assembly (part 2)". youtube.com. Retrieved 1 August 2013. ↑ "Tsakhiagiin Elbegdorj, Mongolian president visits peacekeeping forces in South Sudan". B'nai Darfur. 17 February 2013. Retrieved 7 July 2013. ↑ "Mongolian president visits peacekeeping forces in South Sudan". Sudan Tribune. 17 February 2013. Retrieved 7 July 2013. ↑ "President's son greets from South Sudan". factnews.mn (in Mongolian). 24 June 2013. Retrieved 2 July 2013. ↑ "Diversifying for growth: OBG talks to President Ts. Elbegdorj". Oxford Business Journal, 2013. ↑ "112th Congress (2011–2012) Senate Resolution No.208 -- Expressing the sense of the Senate regarding Mongolian President Tsakhiagiin Elbegdorj's visit to Washington, D.C., and its support for the growing partnership between the United States and Mongolia (Agreed to Senate)". The Library of Congress. 15 June 2011. Retrieved 25 July 2013. ↑ Tonkin, Samantha (29 June 2010). "World Economic Forum shines spotlight on fair mineral development in Mongolia". World Economic Forum. Retrieved 25 July 2013. ↑ Responsible Mineral Development Initiative 2011 (PDF). Davos: World Economic Forum. 2011. p. 33. Retrieved 25 July 2013. ↑ "Responsible mineral development and transparency issues discussed at the Citizens' Hall". president.mn. 2 March 2011. Retrieved 25 July 2013. 1 2 "Mongolian dinosaur skeleton goes home". The Washington Post. Washington. 8 May 2013. Retrieved 24 June 2013. ↑ "Dinosaur Skeleton Illegally Smuggled Into U.S. Goes Home To Mongolia". Fox News Latino. 6 May 2013. Retrieved 7 July 2013. ↑ Parry, Wynne (20 May 2012). "Despite Legal Challenge, Tyrannosaur Sells for $1 million". Live Science. Retrieved 24 June 2013. ↑ Parry, Wynne (17 May 2013). "Smuggled Dinosaur's Return May Boost Mongolian Paleontology". Live Science. Retrieved 25 June 2013. ↑ "Disputed dinosaur fossil auctioned for $1 million in NYC". Associated Press. 21 May 2012. Retrieved 24 June 2013. ↑ Williams, Page (28 January 2013). "Bones of contention: Florida man's curious trade in Mongolian dinosaurs". The New Yorker. New York. Retrieved 7 July 2013. ↑ Painter, Robert (22 June 2012). "Official statement of His Excellency Elbegdorj Tsakhia, President of Mongolia, regarding the seizure of the Tyrannosaurus bataar skeleton by the U.S. Government". Painter Law Firm. Retrieved 24 June 2013. ↑ Parry, Wynne (29 December 2012). "Dealer Pleads Guilty to Smuggling in Largest International Dino Case Ever". Live Science. Retrieved 24 June 2013. ↑ Ferrigno, Lorenze (7 May 2013). "Dinosaur bones headed home to Mongolia". CNN. Retrieved 24 June 2013. ↑ "Photo news: The 70 million year old T-bataar is now available for public viewing in Ulaanbaatar, Mongolia". infomongolia.com. 10 June 2013. Retrieved 25 July 2013. ↑ Ross and McShane, Barbara and Larry (27 December 2012). "Florida paleontologist Eric Prokopi pleads guilty to smuggling pricy dinosaur bones, faces 17 years behind bars". New York Daily News. Retrieved 7 July 2013. ↑ Olien, Jessica (23 January 2013). "How (Not) to Smuggle a Dinosaur". Pacific Standard. Santa Barbara, CA. Retrieved 7 July 2013. ↑ Desai and Kaufman, Sagar and David (24 September 2012). "Mongolian President Talks Corruption And Human Rights". The Crimson (Harvard University). Cambridge, MA. Retrieved 23 June 2013. ↑ Tsakhia, Elbegdorj (29 April 2013). "Every man and woman can live a free and peaceful life". news.mn. Retrieved 29 June 2013. ↑ "Elbegdorj Addresses Dystopic Mongolia". Investorvillage.com. 2 June 2012. Retrieved 29 June 2013. ↑ "Mongolia opposition wins election". BBC News. 25 May 2009. Retrieved 8 August 2012. ↑ E, Enerel (30 June 2012). "Mongolian Economy and Finance". Mongolia Economy (blog). Retrieved 21 June 2013. ↑ "Independent Authority Against Corruption and the President". gogo.mn (in Mongolian). 9 October 2009. Retrieved 21 June 2013. ↑ "New community council established by the president visited IAAC". Independent Authority Against Corruption of Mongolia. 7 October 2009. Retrieved 21 June 2013. ↑ "Partnership Against Corruption Initiative" (PDF). The World Economic Forum. 3 March 2011. Retrieved 8 August 2012. ↑ Ariuka (1 November 2012). "Not to make many Customs Baatar be born". shuurhai.mn (in Mongolian). Retrieved 21 June 2013. ↑ "Speech by Tsakhiagiin Elbegdorj, President of Mongolia at a solemn assembly, dedicated to the 850th anniversary of birth of Chinggis Khaan". Office of the President of Mongolia. 14 November 2012. Retrieved 21 June 2013. ↑ "Mining wealth distribution key issue in Mongolia polls". China Post. 24 June 2013. Retrieved 24 June 2013. ↑ Kaiman, Jonathan (27 June 2012). "Mongolia's new wealth and rising corruption is tearing the nation apart". The Guardian. Retrieved 24 June 2013. ↑ Associated Press (25 June 2013). "Incumbent favored over wrestler as anti-graft pledges dominate Mongolian presidential campaign". Fox News. Retrieved 8 July 2013. ↑ B., Semuun (24 June 2013). "We all 2.9 million pay corruption price: An interview with MP and Justice Minister Kh.Temuujin". news.mn (in Mongolian). Retrieved 24 June 2013. ↑ "Corruption by Country/Mongolia". Transparency International. Retrieved 21 June 2013. ↑ Clinton, Hillary (9 July 2012). "Remarks to the International Women's Leadership Forum". U.S. Department of State. Retrieved 31 July 2012. ↑ "Wide participation at national forum on judicial reform and justice". Business Council of Mongolia. 22 April 2011. Retrieved 31 July 2012. ↑ "Mongolia's President Says Human Rights 'Universal'". Asia Society. 19 September 2011. Retrieved 23 June 2013. ↑ "Mongolian President among six 'Champions of the Earth' named in 2012 UNEP Awards". The United Nations Environmental Programme. 4 June 2012. Retrieved 31 July 2012. ↑ B., Khuder (3 July 2013). "Ban Ki-moon congratulates re-elected President". Montsame News Agency. Retrieved 3 July 2013. 1 2 "Asia Foundation Hosts His Excellency President Elbegdorj of Mongolia". Asia Foundation. 14 June 2011. Retrieved 6 July 2013. ↑ "Tree planting day". Forestry Authority – Government implementing agency of Mongolia(in Mongolian). 7 May 2012. Retrieved 25 July 2013. ↑ Ch., Enkhtuya (10 May 2013). "Tree Planting National Day to run". Montsame News Agency. Retrieved 29 June 2013. ↑ "Planting trees". My Club (online community)(in Mongolian). Retrieved 22 June 2013. 1 2 "Mongolian President Ts. Elbegdorj named as the Global Leader". Mongolian Economy. Ulaanbaatar. 7 June 2012. Retrieved 7 July 2013. ↑ "Green City 2012 campaign prior to Tree Planting Day even will be organized on Builders Square". Mongolia's Ministry of Environment and Green Development(in Mongolian). 10 May 2012. Retrieved 21 June 2013. ↑ Elliott, Richard (7 June 2011). "Mongolian President Declares Intent to Form New Alliance for Water Security". World Economic Forum. Retrieved 6 July 2013. ↑ "President Elbegdorj: "From A Big Government to A Smart Government"". 4 December 2013. Retrieved 21 January 2014. ↑ "Secret To Smart Government". Retrieved 8 January 2014. ↑ "From Big Government to Smart Government". Retrieved 7 January 2014. 1 2 "Members of the State Great Hural join the statement of support for a smart government". 16 December 2013. Retrieved 21 January 2014. ↑ "Mongolian President issues a decree to support students studying in the world's top universities". infomongolia.com. 21 May 2013. Retrieved 22 June 2013. ↑ Tsakhia, Elbegdorj (October 29, 2010). "Elbegdorj:"The Parliament has to resolve students' salaries and tuition first, before deciding to increase the president's salary"". Office of the President of Mongolia. Retrieved June 22, 2013. ↑ P., Galaa (16 April 2013). "Students' 70 thousand will become 96 thousand from next September". undesten.mn (in Mongolian). Retrieved 22 June 2013. ↑ "Elbegdorj Tsakhia – Biography". Mongolia-web.mn. 15 July 2007. Retrieved 29 June 2013. ↑ "Mongolian President HE Elbegdorj Tsakhia receives WHO Regional Director's First Special Recognition Award for Alcohol Control". 24 October 2012. Retrieved 29 June 2013. ↑ "National Network for Mongolia without Alcohol". National Network for Mongolia without Alcohol (in Mongolian). Retrieved 21 June 2013. ↑ "Mongolian President HE Elbegdorj Tsakhia receives WHO Regional Director's First Special Recognition Award for Alcohol Control". 1 November 2012. Retrieved 29 June 2013. ↑ n/a, n.a. "The third millionth citizen was given a name – Mongoljin by the President Ts.Elbegdorj". Info Mongolia. n/a. Retrieved 2015-03-17. ↑ "Kh.Bolormaa: Only one politician for a family interview". Ardchilal (Democracy) newspaper(in Mongolian) (Special ed.). Ulaanbaatar. May 2009. p. 9. ↑ "Mongolian leader becomes first president to dive to bottom of Lake Baikal". RIA Novosti. 16 July 2010. Retrieved 26 July 2013. ↑ "Mongolian President Tsakhiagiin Elbegdorj took part in submersion of Mir". Lake Baikal Protection Fund. 16 July 2010. Retrieved 26 July 2013. 1 2 "President Ts.Elbegdorj, who could not have provided job to his brothers and sisters, put an ad in internet seeking work for his son". shudarga.mn (in Mongolian). 10 May 2013. Retrieved 1 July 2013. ↑ "President's son E.Erdene along with other 210 peacekeepers has successfully completed the UN Mission in South Sudan". infomogolia.com. 2 December 2013. Retrieved 5 January 2014. Brooke, James (25 December 2004). The Saturday Profile; A Mongolian and His Nation, Evolving Together, . The New York Times. p. 5. Retrieved 23 June 2013. Brooke, James (26 December 2004). Mongolian PM evolves from journalist to statesman. Taipei Times. Retrieved 23 June 2013. Brooke, James (15 February 2005). For Mongolians, E Is for English, F Is for Future. The New York Times. Retrieved 23 June 2013. Harvard Kennedy School. John F.Kennedy School of Government (24 September 2012). Mongolian President Discusses Personal Liberty in a Free Country at JFK Jr. Forum- video of Elbegdorj Tsakhia's speech Harvard Kennedy School. Retrieved 5 January 2014. Tsakhia, Elbegdorj (2000). The Years of Bearing Weight. Ulaanbaatar: Hiimori. Tsakhia, Elbegdorj (21 November 2005). Mongolia: Moving Mountains. Washington Post. Retrieved 23 June 2013. Tsakhia, Elbegdorj (6 April 2011). What Mongolia Can Teach the Middle East. Foreign Policy. Retrieved 23 June 2013. Beech, Hannah (20 August 2012). Hesitant Steppes. Time Magazine. Retrieved 23 June 2013. Diamond, Larry. ; Fukuyama, Francis. ; Krasner, Stephen (24 September 2012). Mongolia's Next Challenge. The Wall Street Journal. Retrieved 2 July 2013. Gillet, Kit (13 September 2012). Though Not Yet open, a Huge Mine is Transforming Mongolia. The New York Times. Retrieved 2 July 2013. Wikimedia Commons has media related to Tsakhiagiin Elbegdorj.